In 1228, he finally embarked. His "crusade, actually a state visit, was a diplomatic victory. At Jaffa he made a treaty by which Jerusalem, Nazareth, and Bethlehem were surrendered to the Christians, with the Mosque of Omar being left to the Muslims. In 1229 he crowned himself king at Jerusalem. In 1226, by means of the Golden Bull of Rimini he confirmed the legitimacy of rule by the Teutonic Knights under their headmaster Hermann von Salza over the Prussian lands east of the Vistula, the Chelmno Land. At the time he was crowned Emperor, Frederick had promised to go on crusade. In preparation for his crusade, Frederick had, in 1225, married Yolande of Jerusalem, heiress to the Kingdom of Jerusalem, and immediately taken steps to take control of the Kingdom from his new father-in-law, John of Brienne. However, he continued to take his time in setting off, and in 1227, Frederick was excommunicated by Pope Gregory IX for failing to honor his crusading pledge - perhaps unfairly, at this point, as his plans had been delayed by an epidemic. He eventually embarked on the crusade the following year (1228), which was seen on by the pope as a rude provocation, since the church could not take any part in the honor for the crusade, resulting in a second excommunication. Frederick did not attempt to take Jerusalem by force of arms. Instead, he negotiated restitution of Jerusalem, Nazareth, and Bethlehem to the Kingdom with sultan Al-Kamil, the Ayyubid ruler of the region. Some forty knights were received into the new Order at its foundation by the King of Jerusalem and Frederick of Swabia, who selected their first Master in the name of the Pope and Emperor. The knights of the new confraternity had to be of German birth (although this rule was occasionally relaxed), a unique requirement among the Crusader Orders founded in the Holy Land. They were drawn predominately from the noble or knightly class, although this latter obligation was not formally incorporated into the rule until much later. Their blue mantle, charged with a black cross, was worn over a white tunic, a uniform recognized by the Patriarch of Jerusalem and confirmed by the Pope in 1211. The waves of German knights and pilgrims who followed the Third Crusade brought considerable wealth to the new German Hospital as well as recruits. This enabled the knights to acquire the Lordship of Joscelin and, soon thereafter they built the castle of Montfort (lost in 1271), the rival of the great hospitaller fortress of Krak des Chevaliers. Never as numerous in the Holy Land as either the Hospitaller or Templar Orders, the Teutonic knights were nonetheless a formidable power. We have also said that the next pope would have his sights set on Jerusalem. Ratzinger was known for statements he made concerning a reconciliation of sorts with the Jews. That reconciliation being, "the moment in which Israel too will say yes to Christ. After all, the "star points to Jerusalem, Ratzinger said once. Watch for this new pope to have a more fervent interest in Israeli politics and affairs surrounding Jerusalem. Aachen Aachen in north-western Germany (in French, called Aix-la-Chapelle), was the capital of Charlemagne's empire in the 9th century. It became the site of one of the great medieval pilgrimages because of the textile relics obtained by Charlemagne and Ortho III. The four "Great Relics include the cloak of the Blessed Virgin, the swaddling clothes of the infant Jesus, the cloth on which St. John the Baptist,s head lay after his beheading, and the loin cloth which Jesus wore on the Cross. These four relics were shown only once every seven years. The Pope's special envoy to the celebration was Cardinal Darío Castrillón Hoyos, prefect of the Congregation for the Clergy. The Holy Father addressed the letter to Bishop Heinrich Mussinghoff of Aachen. John Paul II pointed out that the Cathedral, dedicated to the Virgin, was built at the request of Charlemagne. That same year, 800, the emporer was crowned in Rome by Pope Leo III in the Vatican Basilica. This historical event reflects the closeness that existed between that local Church and the diocese of Rome. 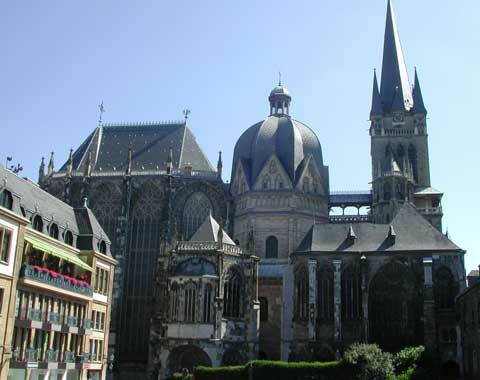 Ed Comment: If the Aachen Cathedral that stands now is supposed to be the Original first church built by Charlemagne, I can NOT see the similarity, sorry Barry. I think the Dormition Abbey looks more like an Armenian Church. 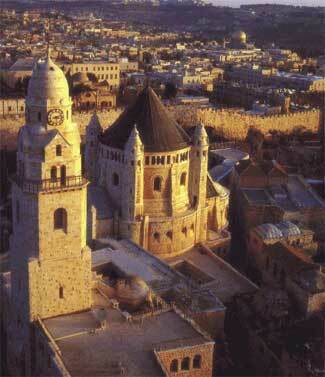 Mount Zion and Dormition Abbey, JerusalemMount Zion lies to the south of today's city walls. 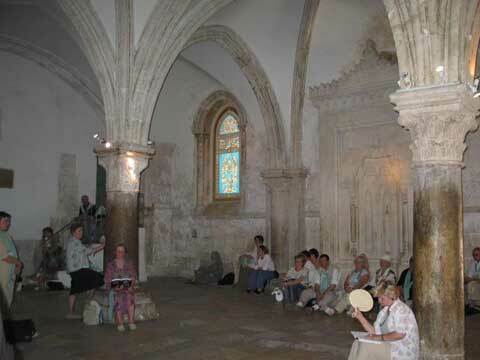 Coming out of Zion Gate you are faced with the Benedictine Basilica of the Dormition. 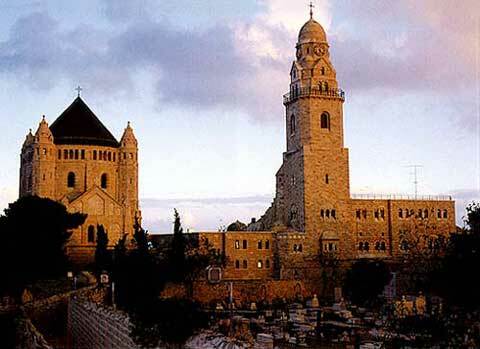 The Dormition Abbey is a massive structure that rises on Mount Zion, just outside the Zion Gate, and resembles a mighty fortress; it is topped by a high, domed belltower, a conical dome and corner towers. This Benedictine Basilica, built over the site where Virgin Mary is said to have fallen asleep for the last time (Dormitio - from here one of the apocryphal writings describing this event). It was completed by Kaiser Wilhelm II at the beginning of 20th century based on plans by Heinrich Renard who used as a model the Carolingian cathedral of Aix-la-Chapelle. When Herzl met the Duke of Baden, the Kaiser's uncle, he tried to persuade him of the importance of a meeting with Kaiser Wilhelm for the Zionist cause. After more than one and a half years of fruitless contacts with influential German figures, Herzl was called to the German consul during a stay in Amsterdam and informed that the German Kaiser was prepared to meet him on his journey to Jerusalem. Kaiser Wilhelm II's first stop on his journey to the land of Israel was at Kushta. In October 1898, Herzl traveled to Kushta, where he met with the Kaiser for the first time and received a promise of a subsequent meeting in Jerusalem. Available at chamish@netvision.net.il are my English books; Shabtai Tzvi, Labor Zionism And The Holocaust; Save Israel! ; Who Murdered Yitzhak Rabin; Israel Betrayed; The Last Days of Israel; Don't order from the website until administrative issues are solved, hopefully this week. Anyone who did so and didn't receive their orders, write me immediately.